Explanation: What's the closest active galaxy to planet Earth? That would be Centaurus A, only 11 million light-years distant. Spanning over 60,000 light-years, the peculiar elliptical galaxy is also known as NGC 5128. Forged in a collision of two otherwise normal galaxies, Centaurus A's fantastic jumble of young blue star clusters, pinkish star forming regions, and imposing dark dust lanes are seen here in remarkable detail. The colourful galaxy portrait is a composite of image data from space- and ground-based telescopes large and small. Near the galaxy's centre, left over cosmic debris is steadily being consumed by a central black hole with a billion times the mass of the Sun. 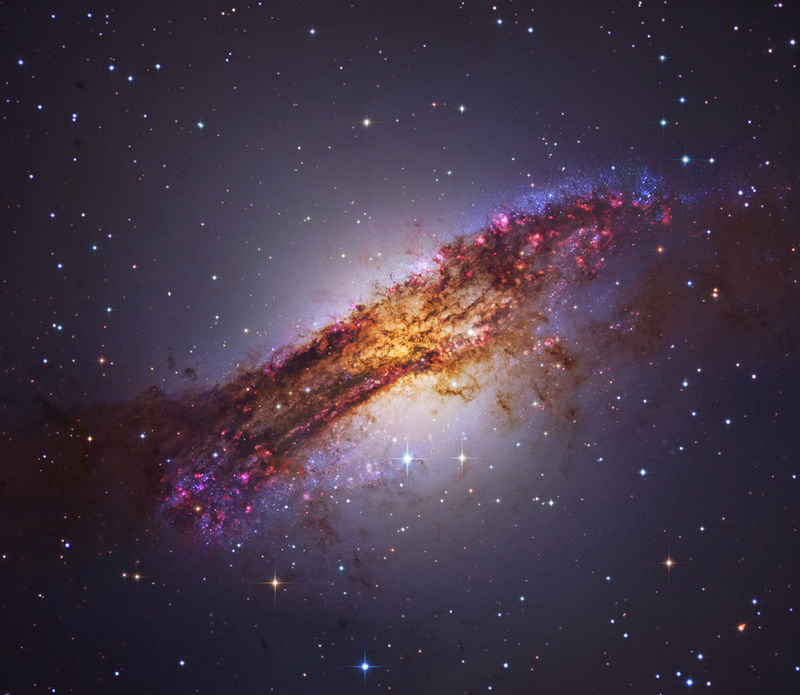 As in other active galaxies, that process generates the radio, X-ray, and gamma-ray energy radiated by Centaurus A.